I have found this a difficult post to write. May was a busy and emotional month for me. I believe I have put off writing about it because I haven’t fully processed the changes. I know I’ll want to remember May 2015 in the future, so I will do my best to document it all here. The events of May/June actually started a few days before, in late April. Will departed for a three week trip to the US, with a side-trip to the Dominican Republic for meetings. While normally I might be a bit lonely while he is away, this was no normal May. The first weekend in May was a birthday of some significance for me. Knowing that I would be celebrating without Will, I organized a couple of events with my girlfriends. May 1st is a public holiday in most of Europe and since it fell on a Friday, I had a long weekend. With some help from The Expatresse, who is now Queen of the Bees, I selected a 10km hike in the eastern part of Luxembourg. Giny, Rachel, and Willow joined us for a strenuous but beautiful hike. Needless to say, the rest of the day was spent relaxing on the sofa, catching up with Very Important television. Saturday meant the normal market run followed by a fabulous bike ride with Rachel. We took the route that had us ride along with Mosel River for a long section and it was beautiful to look up at the vines, with their early leaves. It was a lovely afternoon and some excellent cycling. I finished the day by having dinner with five wonderful ladies, all of whom have come to mean a lot to me in Luxembourg. It was a great way to celebrate my birthday! The second weekend in May was spent cleaning and cycling, which is just about my perfect weekend. The cleaning was a tremendous project –- Will is still grateful he missed the experience. The cycling was also great fun, as I did a longer route with one of my favorite cycling buddies. I gave up after 62km and took the train home, but I am proud to say my partner continued on and did the full 86km. 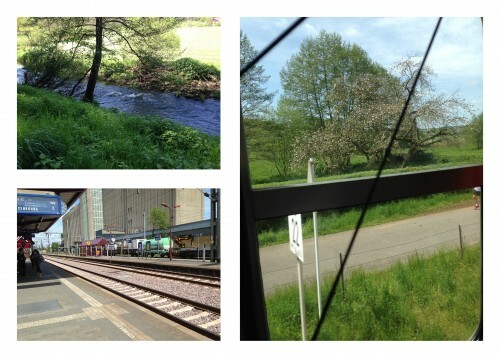 Really, cycling in Luxembourg cannot be beat. When Will’s trip was planned in early 2015, I thought that I would use the time he was gone to do some organizing and culling of some of my “stuff” that has gathered in the apartment. But before he left, we found out that the timing of Rachel & Company’s move back to the US would overlap with his trip. I knew I wanted to spend as much time as I could with Rachel, Jordan, Henry, and Willow before they left. Happily, I was given a chance to spend more time with them than I initially hoped, because of the timing of their movers and their flight. Rachel wrote about many of the events on her own blog, so she saved me the work of telling you all about it. It was a great privilege to be with her family during their last days living in Luxembourg. Thankfully, we should be able to see them when we are back in the US for our visits, so saying goodbye was a bit easier than it might have been. Plus, one family member I didn’t have to say goodbye to at that moment was Willow. Because of family commitments, Willow was going to fly home a week later than everyone else. The morning of the final flight home, Willow and I said goodbye to the crew as they scrambled for the airport. There is a lot of luggage when you move two adults and a toddler! About two hours after Rachel, Jordan, and Henry departed, it was time for Willow and I to go the airport and pick up Will. While Willow surely missed her owners, she was very happy to see Will! After the stress of the move, she enjoyed a few days of jet-lagged Will, since both of them were content to relax and recover from their busy May. On Memorial Day Saturday, Will and I attended the annual Memorial Day service at the American Military Cemetery. As always, the service was moving and emotional. It is a privilege each year to be able to honor those who gave all. 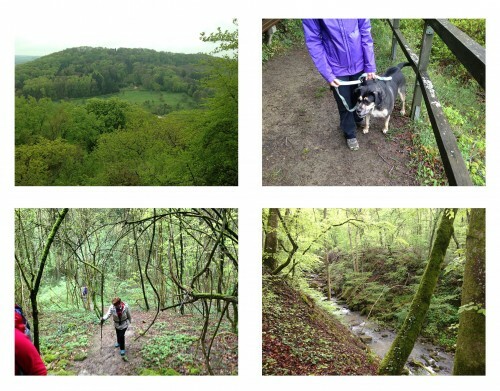 Sunday, we met our friends and Dexter for a hike in the woods. 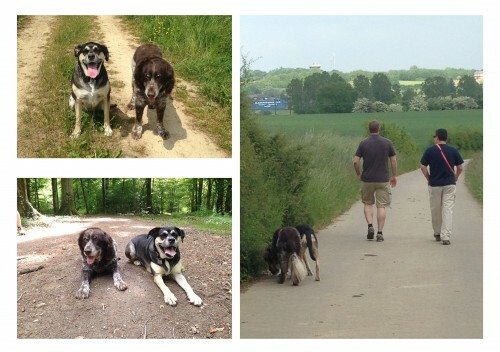 Willow and Dexter are old friends and we wanted them to have one last walk together. Of course, I know that the dogs didn’t realize it was their last walk together, but the humans did! It was a warm day in Luxembourg, so we took it slow for Dexter, who is in his twilight years. What sweeties! 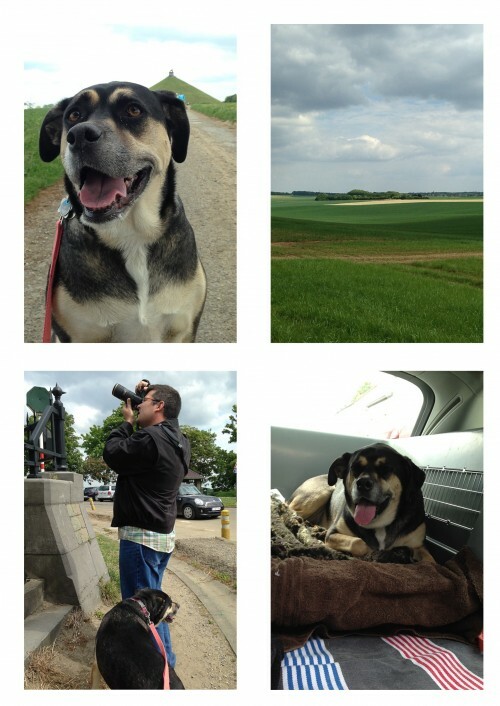 We had a great “last hike” for Willow in Lux. Monday happened to be a public holiday in Lux along with the Memorial Day holiday in the US. Since Willow was flying out the next morning, with a check-in time of 6 a.m., Will, Willow, and I headed for Brussels the afternoon before with the thought of doing some sight-seeing. Because clearly, Willow needed one more jaunt around Europe before returning to her existence in the Midwest. We decided to go to Waterloo, because…. why not? It was close to our final destination (a hotel by the airport) and it is also the 200th anniversary of the battle. 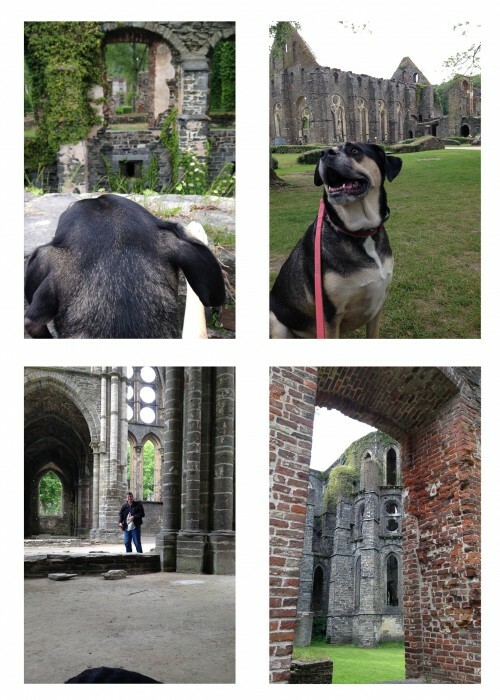 While Waterloo was fine, the real treat was an unplanned stop at Abbaye de Villers. The Abbey is an ancient Cistercian abbey located in the town of Villers-la-Ville. It was founded in 1146 and was abandoned in 1796. The site is mostly ruins, but it is truly fabulous. Even more fabulous… Willow was allowed in! We had a lovely walk around the ruins and enjoyed learning more about the monks who lived there. After a big day, all three of us were exhausted. We headed to bed as soon as we checked into our hotel. 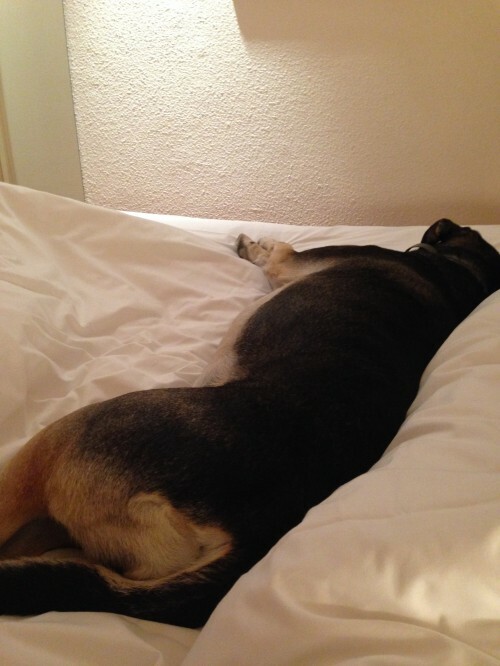 Normally, Willow is not permitted up in bed with us, but for her last night I made an exception. I swear, you could see the smile on her face when she realized she was invited up. It was a sweet way to spend our last night with her. The next morning, she was off on her big day of travel. I will admit it was hard to see the road through my tears. Sending Willow off was the unavoidable sign that our friends were gone on their next adventure. We wish them all the best, but we miss them terribly. Thank goodness for modern communication – while they feel far away, we still get to see what is up in their lives! And then, May was over. Since this post is so long, I decided to break Random Happenings 9 into two parts. June will continue in Part 2.
be in our memories,will always be a part of our life! I really enjoyed reading this post and remembering some of the fun things I got to do during my last weeks in Luxembourg. We’re looking forward to seeing you next month!